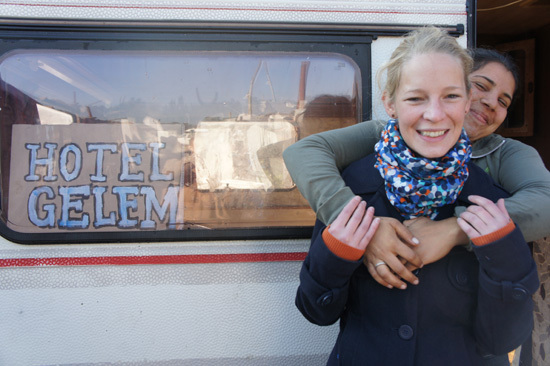 HOTEL GELEM allows participants to explore precarious living conditions first-hand. The Roma communities can invite so-called 'Embedded Tourists'. These tourists are then integrated into the community and experience firsthand the specific living conditions. Sleeping, eating, clothing, and personal hygiene are determined by material and infrastructural conditions. At the same time, visitors are also a bit closer to the dangers and inhospitable social, economic and physical conditions these people must live under. The hosts are free to decide how they would like to interact with the visitors. This is not about putting the Romas up for display; rather, it is about giving visitors the opportunity to be immersed in specific situations that cannot be experienced through pictures or stories. Each specific situation compels improvisation and inventive survival tactics. The common view from outside is distorted by romanticized glorification, kitschy "Gypsy Romance", blame placement and ongoing stigmatization. This outlook sometimes even suggests a link between the catastrophic conditions and the characters and mental competency of the people living in them. The precarious situation is not a suitable justification for the rejection or distancing of the Romas, but vice versa: the catastrophic conditions are a fatal result of the rejection and stigmatization by the majority of society. HOTEL GELEM breaks through disastrous assumptions, connects global tourism with social challenges and calls for a concrete end to racism and exclusion. Your encounters with the Romas will show you how extraordinarily important it is that the people in these hazardous situations are truly recognized and given a genuine chance in our society. The conditioner under which you may visit a HOTEL GELEM is that the Roma community must decide to invite you. Your visit to the community should also have a tangible, positive effect, in which something grows out of your stay. Please give us a brief description of yourself, your wishes and your ideas in the application. We will then gladly contact you.